Content by Gary Nuhn. Originally published on August 26, 1999 @ Dayton Daily News. He was sitting in the sports book at the Mirage Hotel in Las Vegas two years ago when it struck him, in baseball terms, like Juan Marichal's bat on John Roseboro's cranium. Tony Macklin was watching a wall of television screens with every major-league baseball game in America on one or more of the sets. A baseball purist, Macklin loves the game's fundamentals, and as he watched that night, he saw most of them broken. Umps missed calls on every screen, batters swung at ball four, outfielders overthrew the cutoff man, infielders collided going for pop flies. On and on it went. The whole ugly gamut. Within two weeks after getting back home to Dayton, Macklin had written a short story -- an allegory, he calls it -- in which a group of anonymous baseball purists, probably he among them, start a revolution to take back the game from the poseurs who now control it. The apocalyptic story, American Pastime, was published in the May/August issue of the North American Review. 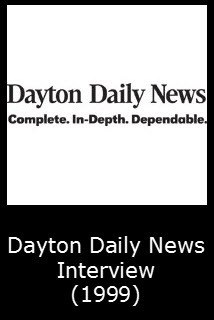 I talked with Macklin on Wednesday on the campus at the University of Dayton, where he has taught for 37 years and is an associate professor of English. The graduate of Villanova grew up near Philadelphia in the '40s and '50s, and like most kids of his generation, was addicted to sports, not video games and Mallspeak. He spent many summer days watching the Phillies and Athletics, which means he saw a lot of bad baseball even before that night in Vegas. Now he has DirecTV's baseball package, so he has access to numerous games on a nightly basis. "Three teams speak to me now," he said. "The Phillies, Reds and White Sox. You watch them and they're all the same -- they don't give up." All are small-payroll teams trying to buck a system distorted by, in Macklin's opinion, "Ego and greed." In the first scene of his story, which starts and ends with bangs, the head of the umpires' union is shot dead at home plate before a game at Veterans' Stadium. The man is a thinly disguised Richie Phillips, current king of the umps. Macklin denies his "fictitious" figure is Phillips, but does not deny his distaste for the man, calling him "Fractious. Agenda-oriented. Insensitive. The end justifies the means. All the things that are a detriment to sports." But it is not just umps that bother Macklin. Here's part of his story's fourth paragraph: "Maybe it was one outlandish salary too many. Maybe it was one city too many blackmailed by a carpetbagging owner... Maybe it was one agent too many that was arrogant. Maybe it was one autograph too many that was costly. Maybe it was one collectible too many that was a sham..."
I suggested to Macklin that he was angry with the game. He said, no, he was sad. I said sad men don't blow away the head of the umps at home plate in the first scene. He said then maybe he's both angry and sad. When a Philadelphia writer showed Phillips the story, Phillips said, "I hate it," Said Macklin, "Best review I ever got." Asked if the game is redeemable or headed irretrievably on the slippery slope to hell, Macklin surprised me and said he thought it could be saved. "I'm a cynic", he said, "but a cynic is a failed romantic. Things work in cycles." While we wait, however, ego and greed are still at the top of their cycle, as the shadows on Tony Macklin's TV confirm nightly.